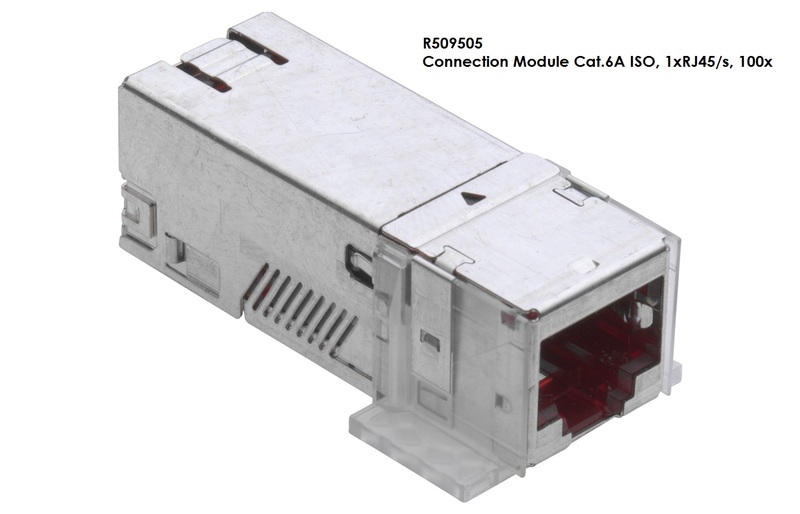 RJ45 connection module of Cat.6A ISO, for the setting up of transmission channels of Class EA with up to 4 plugged connections acc. to ISO/IEC 11801 ed. 2.2, June 2011, EN 50173-1 May 2011 (DIN EN 50173-1) and Class F on 2 pairs, complies with Cat.6A requirements of the standards ISO/IEC 11801 ed. 2.2, June 2011, EN 50173-1 May 2011, as well the U.S. standard Cat.6A according to TIA 568-C.2, re-embedded tested in acc. with IEC 60603-7-51 and 60512-27-100, interoperable and backwards compatible with Category 6 and Category 5e. Connection module Cat.6A ISO, shielded, with EMC cover, dust cover, mounting plate, cable tie and installation instructions.